Celebrations in India | Walk with us! ← Appreciating a good clothes dryer! Parishioners celebrate the one-year anniversary of Sacred Heart Church in Nambur. First, I want to share a photo from the one-year anniversary celebration of the dedication of Sacred Heart Church in Nambur (January 26). To mark the occasion the parish held a Mass and procession beginning at 4 p.m. and running all the way until midnight! I hear that sometimes such celebrations can easily go until dawn. With the SCJ community we celebrated the second annual “Novitiate day.” Last year it was held in March, but this year it was pushed forward to the end of January. I’m not sure why the change but from my point of view this time makes better sense, especially with Easter being early this year. The weather is also a bit cooler, but that can be seen as a minus by many Indians who find temperatures in the 60s to be downright cold! There are 10 in the present novice class along with six postulants. While the show belongs to the novices, the postulants were heavily involved as well, carrying on many of the behind-the-scenes tasks and from time to time becoming part of one or the other of the 17 acts. I’d divide the show into five categories: (1) dance routines, (2) morality plays, (3) audience participation, (4) PowerPoints on the SCJs and the Nambur community, and (5) songs. 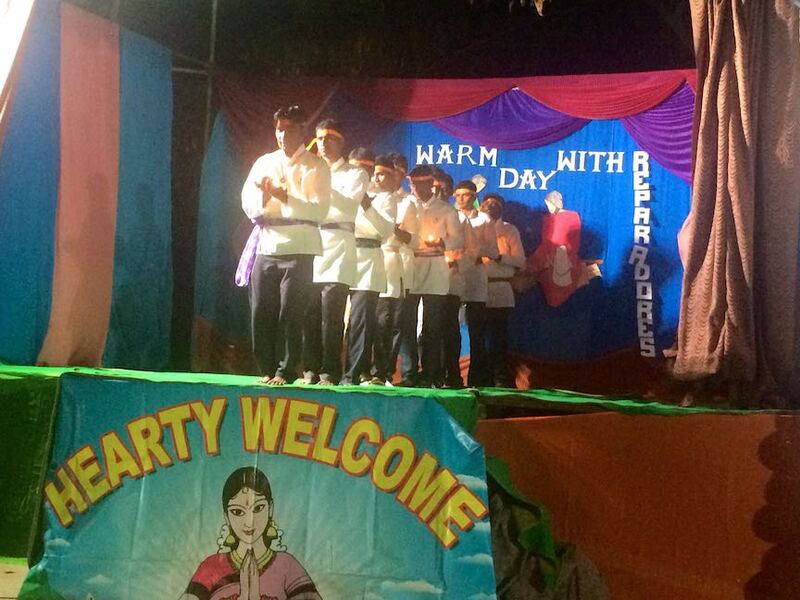 For me, the dance routines and morality plays were the best part of the cultural show. Indian men like to dance and our SCJs are no exception. Some, of course, are better at it then others but all seem to be enjoying themselves. The most serious dance is the one pictured here called the “fire dance.” It was a stately dance using hand and arm motions along with body movements to place the fire pots into differing locations and formations. As for the morality plays I enjoyed the one about corruption the best. It showed how corruption begins at an early age and is pervasive. Sadly, it is a real issue for Indian society. The two PowerPoints were well done though the writing was difficult to read at times. The show lasted just over two hours. One of the novices told me that in their rehearsal they did it in 1 hour and 39 minutes. While it may have gone on a bit long I think that everyone had a good time. Of course, we were all well-paid for our attentiveness with a wonderful meal to end the evening. The picture of the Sacred Heart Church intrigued me by the ambiente. 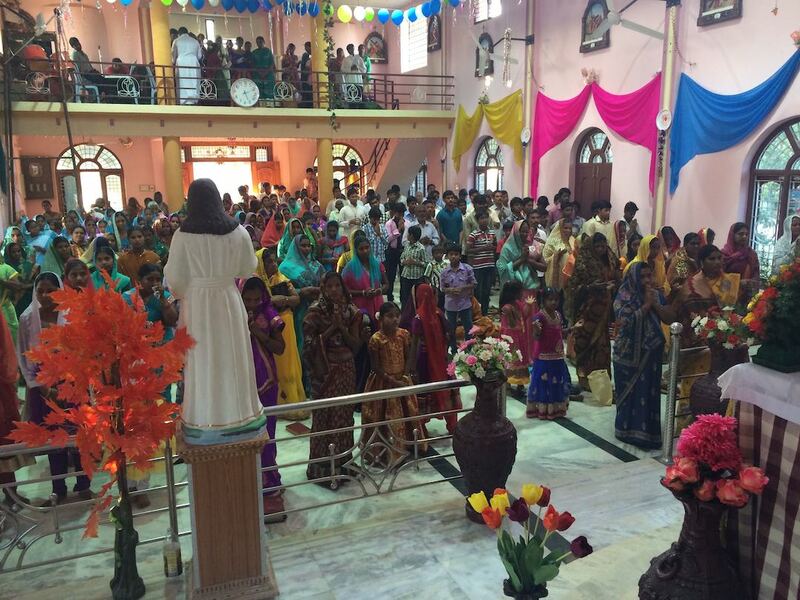 I would say these Indians have something to teach us about Liturgy.